Two weeks ago, Secretary of State Rex Tillerson said that the "longer-term status of President Assad will be decided by the Syrian people,” and UN ambassador Nikki Haley, declared that the Trump administration's "priority is no longer to sit there and focus on getting Assad out." With that shrug of the shoulders from the Trump administration, Assad felt unrestrained enough to launch a horrifying attack in Syria last week. Syrian jets dropped sarin and chlorine gas from the air, killing more than 80 people including 27 children (links to graphic photo). This was another terrible chapter in the Syrian Civil War, and I like many, wished/demanded that something be done. Trump did decide to do something. Well, his first reaction was to blame President Obama for it. Then, possibly influenced by his newest staff member Ivanka, he decided to take action. The United States fired 50 tomahawk missiles at the airstrip from which the Syrian planes involved in the chemical attack took off. Like much of Trump’s action, this so far has proven to be told by an idiot, full of sound and fury signifying (and accomplishing) nothing. The next day after the U.S. strike, Syrian planes took off from that very airstrip, to launch conventional attacks against the same town on which they had dropped chemical weapons. Regardless of whether that missile strike was effective, many on both sides of the aisle greeted the action against the Assad positively; feeling the U.S. must act in the face of such an atrocity. Trump reversed his stance on military action in Syria completely and then acted immediately without devising a long-term plan or strategy. It’s one (stupid, pathetic) thing to act out without thinking if Saturday Night Live makes fun of you, it’s another (scary, tragic) thing to do that with people’s lives. Trump and the Republican party see no conflict in their beliefs that they need to bomb Syria to save Syrian children, but also need to ban Syrian children from entering the United States. The media felt that Trump launching missiles finally made him presidential. Trump's one takeaway may be that people like him when blows stuff up. That should work out well. Based on most recent available information from 2015, Trump owns stock in Raytheon, which made the tomahawk missiles used in Syria. Raytheon is up over 2% since the launch. Senator John McCain (R-AZ) said the Congressional authorization of force from 2001, which was in response to 9/11 (which has nothing to do with Syria), gave Trump the power to do this. That Speaker of the House Paul Ryan (R-WI) would not call representatives back from spring break to discuss the use of force. Violating the Constitution is much less scary to Paul Ryan than trying to pull Jason Chaffetz (R-UT) and Darrell Issa (R-CA) from partying on Lake Havasu. 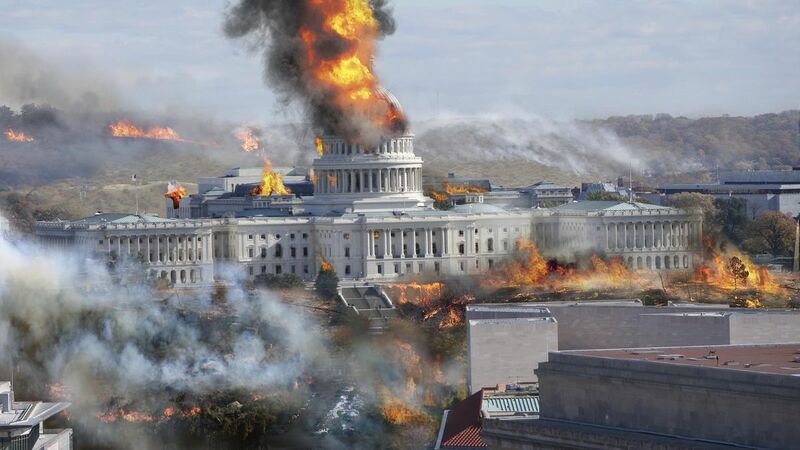 While Tomahawk missiles were landing in Syria, Senate Majority Leader Mitch McConnell (R-KY) dropped a bomb on the U.S. Capitol as well as the Democrats trying to stop Neil Gorsuch from serving on the Supreme Court for the next 40 years. When 44 Democrats opposed Gorsuch’s nomination, the Republican-controlled Senate voted to approve the “nuclear option” to eliminate the filibuster, i.e., a 60 vote minimum, for Supreme Court justices. Gorsuch has since been confirmed to the Supreme Court. Just kidding! Those are all quotes from Republicans when Democrats were threatening to end the filibuster for non-Supreme Court appointments. Impressive to see the Republican senators are so willing to let their thinking evolve on an issue at an older age. Now, after denying President Obama a nominee, McConnell immediately moved to destroy a Senate rule to push in Gorsuch, who has a record to the right of Justice Antonin Scalia and who was nominated without the Trump administration even soliciting courtesy input from Democrats. So, McConnell dropped the bomb and ended the war . . . as the victor. I hope everyone is lighting their Ginsburg, Kennedy, and Breyer votive candles tonight. Just a friendly reminder, in case with everything going on you had forgotten, that the Trump administration is being investigated by the FBI for treason. Secretary of State Betsy DuVos’s brother and mercenary firm Blackwater founder Erik Prince (how bad must have their parents, or more realistically nannies, have been to raise these two) held a secret meeting in Seychelles on January 11 with a Russian pal of Putin in order to establish (yet another) communication channel between Putin and Trump. When Ivanka’s husband applied for top secret security clearance, he “forgot” to disclose literally dozens of meetings with Russians. Since he submitted his application while the entire administration was being investigated for collusion with the Russians, I can totally see how that would slip Jared Kushner's mind. National Sexual Assault Awareness and Prevention Month – Building off his terrible attempts at recognizing Black History Month and Holocaust Remembrance Day, admitted woman grabber Trump kicked off National Sexual Assault Awareness and Prevention Month by defending Bill O’Reilly. This week, The New York Times revealed that O'Reilly and Fox News had paid out $13 million to five women since 2002 over sexual harassment accusations. “I don’t think Bill did anything wrong.” The good news is that corporations feel differently and O’Reilly is losing advertisers, bigly. The Only Way to Fly – National Economic Council Director Gary Cohn assured CEOs that Trump would not tax private jets to pay for air traffic control improvements. Citizens in rural Ohio, Wisconsin, and Michigan flooded the streets in celebration. Don’t Get the Lead Out – Trump took a bold step to reduce college debt. He will attempt to lower the number of college graduates by defunding EPA programs that protect children from lead-based paint. Forget it, DiFi. It’s Trumptown. – The Bureau of Land Management laid the groundwork for eliminating the need for federal approval for a private company to pump groundwater out from under the Mojave desert. Senator Dianne Feinstein (D-CA) has long opposed this project. (Un)Equal Pay Day – Oh, wait, Trump had the opportunity to celebrate a second event in honor of women this month. On the eve of Equal Pay Day, Trump eliminated the requirement that federal contractors had to share salary information in order to show equal treatment of women. He also eliminated the policy that federal contractors are not allowed to require private arbitration for sexual harassment claims. No word on if Bill O’Reilly was there for the signing ceremony. In Salon, an attorney, new to immigration work, describes the “unbelievably cruel system” that hides immigration detainees, even from their family and lawyer. Jared Kushner goes on a field trip to Iraq! Here’s what he turned in as his “What I did on Spring Break” report. And get a new one. Fight for the Future will pay you $15,000 to help you start an “A-Team” to fight Trump’s agenda. In their words, “An A-Team is like a special ops team for activism, with all the skills needed to create political change.” It can be in any area you’re passionate about from health care to net neutrality to renewable energy. Check it out and send in your application and resignation letter! We will do our best to provide accurate and somewhat timely information. We are not journalists. However, our Editor was the Sports Editor of his high school paper and also did a nightly radio update in college on what the cafeteria was serving, so that's more direct experience for this job than Donald Trump has for his current one. If you like what we do here, subscribe and tell a friend! Copyright © 2017 The TrumpShaker, All rights reserved.